If the last two years hadn't happened, the progression of events that led to these jokes would seem entirely made-up. The images look like a Dead Kennedys or NOFX album cover that's a little too on the nose. On Monday, President Donald Trump hosted the Clemson football team at the White House to celebrate their national championship victory. Nothing too weird about that. However, because of the ongoing government shutdown, the White House staff was thin, so the President served the college students a massive buffet of fast food. It was the kind of feast you may have dreamed of in middle school. Photos of the President standing behind a table loaded with Big Macs, french fries, BBQ sauce packets, and other fast food staples quickly circulated on social media. It was... an unexpected sight. Tuesday morning, the President took to Twitter to boast about the spread, emphasizing that he paid for the meal. Naturally, there was a spelling error. 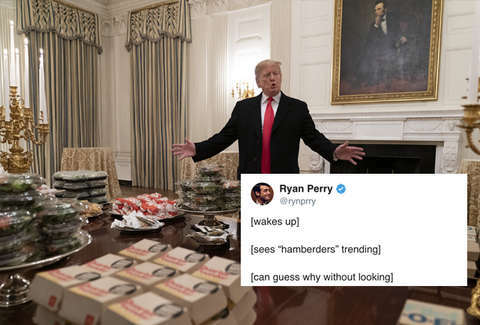 The President boasted about his smorgasberd of "over 1000 hamberders etc." 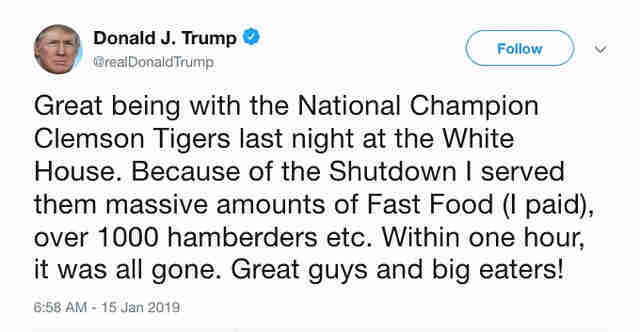 The tweet stayed up for more than three hours before it was corrected, ensuring that pretty much everyone had their shot to hear about the delicious hamberders. Between the images of the dinner and the "hamberders" tweet, the event provided ample fodder for jokes and memes about a President who types like Dr. Steve Brule talks. Even Burger King dropped a joke. Here are some of the best jokes to come out of the fast food fiesta. If you're able to look away, you win the Hambirdger Box Challenge. Hamberders and a cup of covfefe. On the White House menu tonight: Smocked salmon and Hamberder! Sometimes life feels like a Mad Libs filled out by Damien from The Omen.